Top: Buddhist Temple and Monastery. Bottom: Akhila Jami Masjid. Sajid-Bin-Doza, who won the hearts of his viewers with his last exhibition of forgotten historical buildings, charms his onlookers once more at the Alliance Française gallery. Sajid's precise lines and sketches of pen and pencil have amazed onlookers before. This time Sajid's subject is mud-huts of the countryside in Bangladesh. Once more it is the preservation of our cultural heritage that inspires the artist. "These mud houses are both sophisticated and scientific," says Sajid. This is a silent plea to preserve and retain our original homes in the villages. There is the craze to go in for the "pucca" houses. Rural habits influence the entire country. Those living within mud homes should be proud of their homes and cling on to their original homes, the artist, also an architect, says. Sixty percent of mud structures in Bangladesh are in the north and northeastern zone. One even finds double storied mosques and large temples here. In the tiers of roofs in Santal homes, we find places where people store their food for the next seasons. "These remain innovative techniques, " says Sajid. The roofing too is very convenient and suits our hot and rainy climates. These are scientific and sustainable elements, as Sajid tells us. The thatching is done with bamboo, straw and dry-leaves. The walls are made with compressed mud with adhesive made from organics like grass, fermented leaves and juice of leaves. These mud houses, are different from those found in other parts of the world such as those in Africa (Mali mosque) and Rajasthan. This can be called the Bengali rural style, which is something unique. Earlier Sajid had explored unknown historical sights. Those were something that history had left us in the form of pillars, arches and domes. Temples, mosques, palaces and homes of the rich had been presented with an impact. These were situated in Gaur, North Bengal, where the artist had grown up, and went to school and collage. As a practising architect he wanted to draw people's attention to the historical buildings. The people making the mud houses have no lessons in architecture and yet they make items, which are fascinating. Going regularly to the homes of his grandparents in Nauga and Chapainawabganj, the artist's mind studied and memorised the homes in details, for 25 years. Sajid has used pen and pencil in his work, combined with watercolour washes at the back. There are 27 pieces and it took the artist 17 months, working at night for three hours, after his other routine work. In the Akhila Jami Masjid, one of the first structures in Sajid's collection, we find a neat and imposing two-storied structure with bamboo and wooden pillars, and deep slanting "chouchala" This Friday mosque is rich and elegant in architecture and is 67 years old. The Buddhist temple was built in 1885. The walls and panels are wooden. The roofing style shows spiritual style of the space. Boro Buddha Mandir in Cox's Bazar is built six feet above the ground. The temple appears like some element of nature in the jungle and hilly settings. It buzzes with devotees day and night. Sajid-bin-Doza, who is currently doing research on "Shelter Design and Development", has had two solo exhibitions. He has taken part in eight workshops and seminars. He has won 10 international awards in India and Bangladesh. He is also senior lecturer in the Department of Architecture at Brac University. Left: Rural House at Kanshat. 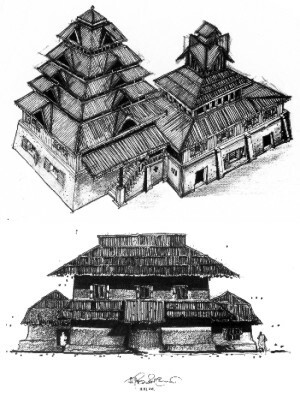 Right: Two-storied Mud Architecture.